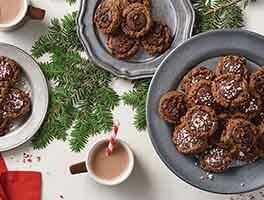 A simple twist turns classic peanut butter cookies into elegant chocolate-hazelnut cookies — either soft and chewy, or crunchy, depending on how long you bake them. 22 mins. to 37 mins. *Don't have hazelnut flavor? See "tips," below. Beat together the shortening, sugars, egg, vanilla, espresso powder, hazelnut flavor, cocoa powder, baking soda, salt, and chocolate-hazelnut spread until smooth. Add the flour, beating gently until everything is well combined; the dough will be quite stiff and a bit crumbly. If it doesn't hold together well, drizzle in enough water or cold coffee (1 tablespoon or less) to bring it together. Watch out, though; if you add too much liquid, the cookies will flatten and spread out too much as they bake. Drop the cookie dough by teaspoonfuls or tablepoonfuls onto the prepared baking sheets (a teaspoon or tablespoon cookie scoop works well here), leaving 2" between them. 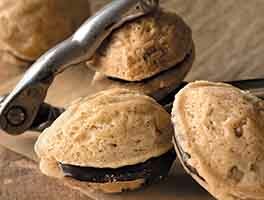 The larger balls of dough will be about 1 1/2" in diameter, and weigh a generous 1 ounce each (if you have a scale); the smaller ones will be about 1 1/4" in diameter, and about 1/2 ounce in weight. Use a large dinner fork to flatten each cookie to about 3/8" thick, making a cross-hatch design. Bake the cookies for 7 to 12 minutes, until they don't appear super-moist any longer, and seem set. Since they're dark colored, it's difficult to tell when they're done by whether or not they're browned; it's a good idea to bake one test cookie first, to figure out the timing. Smaller cookies baked for the shorter amount of time will be softer; larger cookies baked for the longest amount of time will be crunchy. See "tips," at left, for more details. Remove the cookies from the oven, and cool right on the pan; or on a rack. Yield: 22 to 24 large (2 3/4" to 3") cookies; or about 4 dozen smaller (2") cookies. Hazelnut flavor takes these cookies over the top, taste-wise. If you don't have hazelnut flavor, the cookies will taste good, but not overly "hazelnutty." Substitute 1/4 teaspoon almond extract for the hazelnut, if you like; almond will give the cookies a vaguely nutty flavor, though it won't be hazelnut. A better substitute is 3/4 teaspoon vanilla-butternut flavor, if you have it. 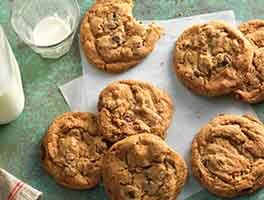 The wide range of baking times covers both small and large cookies, plus three textures: soft; soft in the center, crisp on the edges; and crunchy all the way through. All times assume baking on a light-colored aluminum pan lined with parchment. Bake the teaspoon-scoop cookies for 7 minutes if you like them soft; 11 to 12 minutes if you like them crunchy. The larger, tablespoon scoop-size cookies will be soft when baked for 8 minutes; and crunchy when baked for 12 to 13 minutes. 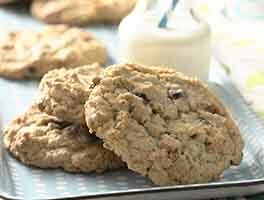 Want to make these cookies with whole wheat flour? Go right ahead; we often substitute King Arthur Unbleached White Whole Wheat Flour 1:1 for the all-purpose flour, no additional changes needed. 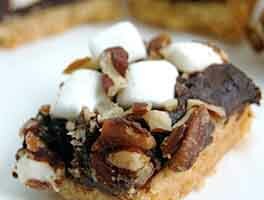 I made this once before and reviewed it using Nutella and topped them with KAF sparkling white sugar. Becuase I didn't have the hazelnut flavor - mostly the chocolate flavor came through. No matter though - my husband told me the cookies reminded him of the Dutch Cocoa cookies from Archway. I decided to try this recipe again - this time using Hershey's Chocolate Spreads - Chocolate Flavor (it's right next to Nutella and their own Hazelnut Chocolate spread). Once again I topped the cookies with the sparkling white sugar and they came out fairly close to the Archway cookies. 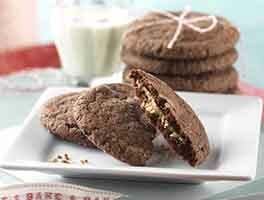 I also used the triple cocoa blend which yields a chocolate cookie with a deep flavor. Very, very nice. These will be part of my "regular rotation" and I'm thinking about adding them to my Christmas cookie tray. I made this recipe today for my kids and followed it exactly with the exception of the hazelnut flavoring and added 2 tsp of cold coffee. Delicious - not too sweet, great texture and great chocolate flavor!! Before baking, I sprinkled the top with coarse sugar for a little "crunch" and the cookies were terrific; nicely tender on the inside and slightly crunchy on the outside. Next time I make them (and there will be a next time!) I'd like to add the hazelnut flavor and I'm thinking about adding about a cup or so of choco chips to the batter and see what'll happen. Yum!! These were ok, just not great. Used recipe as written except used a mocha coffee mix instead of espresso. For The hazelnut flavor I used the maximum measure stated because I like hazelnut. Tasted a bit artificial, like store bought cookies, in my opinion. I wouldn't make them again.Old recipe was much better - very disappointing! Made these with butter, hazelnut extract, and cocoa powder that was a mix of Dutched and natural. Didn't need to add any water. Baked them the longer time & got a nicely crunchy cookie. They are good (OK, pretty darn good), but don't have that quintessential Nutella taste. Next time, I think I'll try adding hazelnuts. I love hazelnut flavor and can't imagine not including it in the ingredients. The cookie tastes lovely and with a cup of fresh coffee it is heavenly. I gave it four stars because of the presentation; the edges looked a little rough. The dough is dry and I didn't any additional water, perhaps I should have and maybe the cookie would have looked prettier. I will definitely make them again. The new favorite cookie in our house. Very easy to prepare and absolutely delicious. Wonderful tasting cookie- I made it with the almond extract as I didn't have any hazelnut- the only drawback- the dough it VERY dry even in the humid climate where I live. I added 1 tablespoon of water and it still didn't completely stick together but I was able to roll it into balls in my hands and the cookies came out beautifully so maybe that was what it was supposed to do? I didn't love these cookies nor did I dislike them. As the recipe noted, omitting the hazelnut flavor is not recommended. In fact, I would not list that ingredient as optional. I added the espresso powder but omitted the hazelnut flavor as I did not have any on hand. I also did not use any other flavor accents except the vanilla that is called for. My recommendation would be to save these cookies for when you do have the hazelnut flavor to add as an ingredient. Without the hazelnut flavor, the cookies don't really have a recognizable taste, except for maybe coffee. The preparation was easy and quick. I did have to add a little water to the mix as the recipe suggested might be necessary. And the cooking times were accurate. I decided that I liked the larger tablespoon cookies at 10 minutes. But in the end I would not recommend this recipe as the taste was not overly yummy. Excellent recipe. And I thought I had all the good chocolate recipes I could use, then comes this one. My husband is hooked big time...and so am I.